Since way back in the AOL days, my email address has been “celticjlp”. I am more than a bit of a Celtophile. I have made four pilgrimages to the Emerald Isle. On all things Celtic, I have facilitated forums, I have led retreats and I have tutored a disciple or two. I am steeped, as steeped as I can be, in the history and spirituality of my chosen people. Let me recount just a few of the things that connect me so deeply to my Celtic ancestors. They worshipped the sun and the moon and the stars. They wove the sacred into their most ordinary of chores. They hallowed each and every very hour of each and every day with prayer. Their sanctuaries are the forests and the meadows and the cliffs. Holy spirits indwell their streams and inhabit their oak groves. Holy winds blow on their most remote islands and holy waves crash on their island’s shores. Every little blade of Celtic green grass practically shimmers with the divine. Well almost. Not to over romanticize my chosen people, the Celts were a nomadic people who probably practiced human sacrifice. Not too often — but one human sacrifice is one too many. The Celts were a warrior people who liked to collect the skulls of those they conquered as trophies. They were a tribal people where both women and men exercised royal power. Yes, women in power. What’s not to like? And this brings me to Boudica, the Celtic Warrior Queen. Boudica, for those who do not know, was queen of the Iceni, a Celtic tribe of Britain in the 1st century of the Common Era. During the time of the Roman occupation, Boudica’s husband was able to keep his crown. Upon his death, however, the Romans rolled over the Iceni. They captured its people and confiscated their property. Boudica was flogged and her daughters raped. No one would have blamed Boudica, if she gave into defeat and despair. But hell no, Boudica rescued her daughters, climbed into her chariot, and led the Iceni army in the charge against Rome. She put down the 9th Legion, destroyed the Roman capital and went on to conquer London, another stronghold of the occupiers. There was bloodshed beyond measure and Boudica was eventually beaten back. It is said she took her own life to avoid capture. No one knows where Boudica is buried. But all of Celtic Britain knows her story, every little boy and every little girl. And so this brings me to Brigid. In the second half of the 5th century, there was Brigid, Bishop Brigid of Kildare. Brigid is both the name of a Celtic goddess and the name of a saint. For the ancient Celts, Brigid is the three-faced goddess of poetry, metal work, and fire. And for Celtic Christians, Saint Brigid is the founder of the monastery at Kildare, the Church of the Oak. Kildare was a “double monastery” home to both religious men and women. And these Celtic Christian brothers and sisters were permitted to marry and raise children in service to the Lord. And Brigid, the abbess of Kildare, Celtic history tells us was consecrated a Bishop. Carved into the stone altar rail at the Rock of Cashel, Bishop Brigid, crozier in hand, leads a procession of the twelve apostles. The Roman Catholic Church turned her crozier into a butter churn and demoted Brigid from Bishop to milkmaid. Hopefully and forever, the hierarchy thought they had put in her rightful and inferior place. The real Brigid did not remain buried forever. She has been resurrected and reincarnated in the fictitious and fabulous Sister Fidelma. Fidelma is the creation of Celtic scholar turned mystery writer, pen-named Peter Tremayne. Set in 7th century Ireland, the Sister Fidelma stories are a delicious combination of history and mystery. Fidelma is of royal blood, a princess of the Eoghanacht, educated to the level of dalaigh, an adovocate of the Brehon courts, just below judge. She is also a member of the monastery at Kildare, and married to Brother Eadulf. Yes, married to Brother Eadulf, a Saxon monk, who is Dr. Watson to her Sherlock Holmes. And by the time Fidelma and Eadulf are solving their 20th murder or so they even have a baby. Crack open one or two of these books and you will be hooked. Tremayne gives them hokey Agatha Christie titles like “Absolution by Murder”, “Shroud for the Archbishop”, “Our Lady of Darkness” and “Whispers of the Dead”. Who says women can’t have it all? Boudica. Brigid. Fidelma. When feeling the need to slay a dragon or two – or just feeling a touch grandly grandiose — who better for my bipolar brain to channel than the spirits of these holy three, this Celtic and oh so feminist trinity. Boudica — queen, warrior, widow, mother and savior of her people. 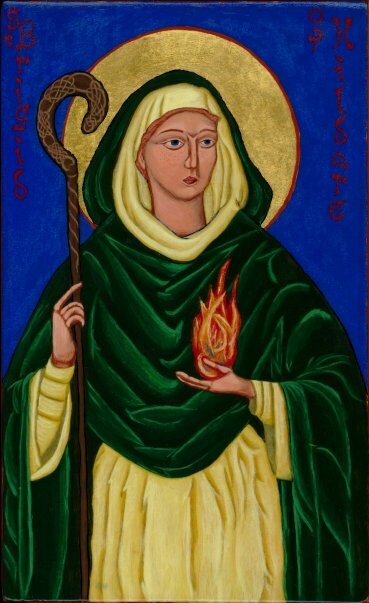 Brigid — goddess, abbess, priestess, bishop and saint. Fidelma — princess, sister, lawyer, detective and murder mystery solver. Their icons and statues grace my halls and walls. Their books and biographies fill my bookcases. I have embraced their stories and made them my own. It may seem silly, but to tell you the God’s honest truth, I believe these three women are kin to me. And oh my this little trinity has given me the energy to get my warrior on — from time to time.. And so I believe myself to be their sister – their soul sister. Joani, the soul sister of Boudica, Brigid and Fidelma. Crazy, huh? Yes, Celtic crazy. And you can celebrate this craziness, too. Come join me Sunday, February 3rd for a Celtic Eucharist at both 8:00 & 10:30 AM, a between the services forum on Women in The Celtic World at 9:15 AM, and an “Irish Coffee” Hour in the Parish Hall with an Irish Step performance by the Boyle School dancers! Emmanuel is the place: 1608 Russell Road Alexandria, VA. Categories: Spirituality and Mental Health | Tags: bipolar disorder, Boudicca, Brigid of Kildare, Celtic Eucharist, Celtic Spirituality, Emmanuel Episcopal Church Russell Rd Alexandria VA, Sister Fidelma | Permalink. Let me recount just a few of the things that connect me so deeply to my Celtic ancestors. They worshipped the sun and the moon and the stars. They wove the sacred into their most ordinary of chores. They hallowed each and every very hour of each and every day with prayer. Their sanctuaries are the forests and the meadows and the cliffs. Holy spirits indwell their streams and inhabit their oak groves. Holy winds blow on their most remote islands and holy waves crash on their island’s shores. Every little blade of Celtic green grass practically shimmers with the divine. Well almost. Boudica, for those who do not know, was queen of the Iceni, a Celtic tribe of Britain in the 1st century of the Common Era. During the time of the Roman occupation, Boudica’s husband was able to keep his crown. Upon his death, however, the Romans rolled over the Iceni. They captured its people and confiscated their property. Boudica was flogged and her daughters raped. No one would have blamed Boudica, if she gave into defeat and despair. But hell no, Boudica rescued her daughters, climbed into her chariot, and led the Iceni army in the charge against Rome. She put down the 9th Legion, destroyed the Roman capital and went on to conquer London, another stronghold of the occupiers. There was bloodshed beyond measure and Boudica was eventually beaten back. It is said she took her own life to avoid capture. No one knows where Boudica is buried. But all of Celtic Britain knows her story, every little boy and every little girl. In the second half of the 5th century, there was Brigid, Bishop Brigid of Kildare. Brigid is both the name of a Celtic goddess and the name of a saint. For the ancient Celts, Brigid is the three-faced goddess of poetry, metal work, and fire. And for Celtic Christians, Saint Brigid is the founder of the monastery at Kildare, the Church of the Oak. Kildare was a “double monastery” home to both religious men and women. And these Celtic Christian brothers and sisters were permitted to marry and raise children in service to the Lord. And Brigid, the abbess of Kildare, Celtic history tells us was consecrated as a Bishop. Carved into the stone altar rail at the Rock of Cashel, Bishop Brigid, crozier in hand, leads a procession of the twelve apostles. The Roman Catholic Church turned her crozier into a butter churn and demoted Brigid from Bishop to milkmaid. Hopefully and forever, the hierarchy thought they had put in her rightful and inferior place. The real Brigid did not remain buried forever. She has been resurrected and reincarnated in the fictitious and fabulous Sister Fidelma. 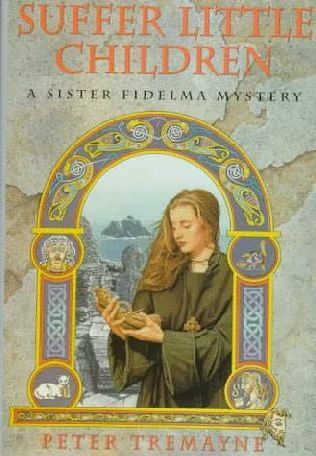 Fidelma is the creation of Celtic scholar turned mystery writer, pen-named Peter Tremayne. Set in 7th century Ireland, the Sister Fidelma stories are a delicious combination of history and mystery. Fidelma is of royal blood, a princess of the Eoghanacht, educated to the level of dalaigh, an adovocate of the Brehon courts, just below judge. She is also a member of the monastery at Kildare, and married to Brother Eadulf. Yes, married to Brother Eadulf, a Saxon monk, who is Dr. Watson to her Sherlock Holmes. And by the time Fidelma and Eadulf are solving their 20th murder or so they even have a baby. Crack open one or two of these books and you will be hooked. Tremayne gives them hokey Agatha Christie titles like “Absolution by Murder”, “Shroud for the Archbishop”, “Our Lady of Darkness” and “Whispers of the Dead”. Who says women can’t have it all? Boudica. Brigid. Fidelma. When feeling the need to slay a dragon or two – or just feeling a touch grandly grandiose — who better for my bipolar brain to channel than the spirits of these holy three, this Celtic and o so feminist trinity. Boudica — queen, warrior, widow, mother and savior of her people. Brigid — goddess, abbess, priestess, bishop and saint. Fidelma — princess, sister, lawyer, detective and murder mystery solver. Their icons and statues grace my halls and walls. Their books and biographies fill my bookcases. I have embraced their stories and made them my own. It may seem silly, but to tell you the God’s honest truth, I believe these three women are kin to me. And O my, my this little trinity has given me the energy to get my warrior on — from time to time.. And so I believe myself to be their sister – their soul sister. Joani, the soul sister of Boudica, Brigid and Fidelma. Crazy, huh? Yes, Crazy, bipolar Celtic crazy. The best kind of crazy there is. The best kind of crazy of all. So friends, whose spirits are you channeling today? Categories: Spirituality and Mental Health | Tags: bipolar disorder, Boudica, Brigid of Kildare, Celtic Spirituality, feminism, Saint Patrick's Day, Sister Fidelma, The Celts | Permalink. It may seem silly, but to tell you the God’s honest truth, I believe these three women are kin to me. And O my, my this little trinity has given me the energy to get my warrior on — especially these last few weeks. And so I believe myself to be their sister – their soul sister. Joani, the soul sister of Boudica, Brigid and Fidelma. Crazy, huh? Categories: Spirituality and Mental Health | Tags: bipolar disorder, Boudica, Brigid of Kildare, Celtic Spirituality, Sister Fidelma | Permalink.